The Resilience concept has been largely debated in different disciplinary fields since the Seventies. An important contribution to the definition of Resilience itself and to the development of a peculiar focus on Urban Resilience has been recently provided by studies and researches on climate change. In this field, resilience has been defined as a set of adaptive capacities of urban systems dealing with different stress factors and, in particular, with phenomena of climate change and oil resources scarcity. A resilient city is defined as a city capable of absorbing shock and/or disturbances, without suffering significant alterations in its functional organization, its structure and identity features. 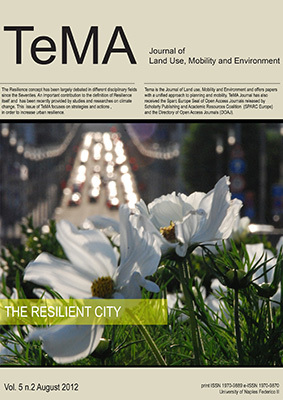 According to these studies, this issue of TeMA focuses on national strategies and actions implemented both in European and in different national and urban contexts, in order to increase urban resilience in face of the main factors threatening their development and, in particular, of climate change, related natural hazards and oil resources scarcity.